The Balloon Fiesta in Albuquerque is a must-visit travel destination for families with young children- but it’s important to be prepared. Here’s a simple list of what to pack. 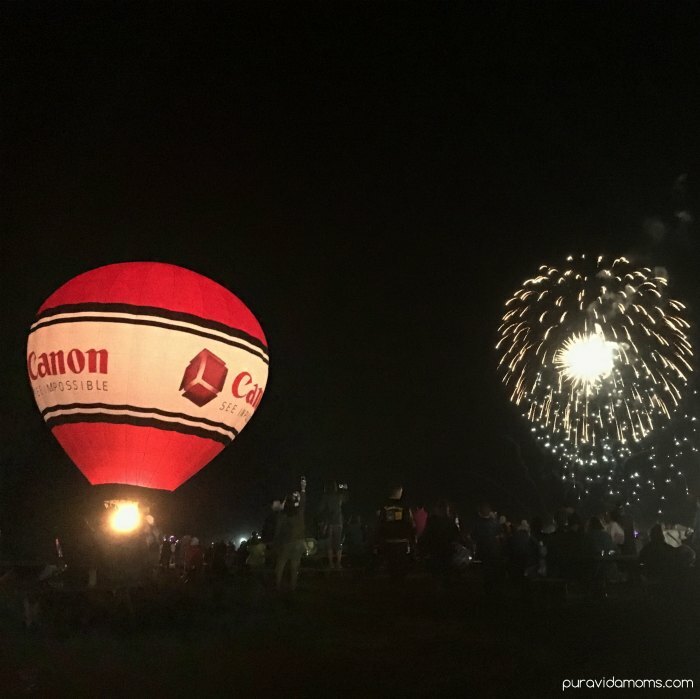 We spent time this year at the Albuquerque International Balloon Fiesta in New Mexico- it was our first visit and we absolutely loved it. From everything to the scenic drive to the fabulous people of Albuquerque, from the amazing New Mexican food to the detailed manner in which the event was organized, I would highly recommend the trip for absolutely anyone. 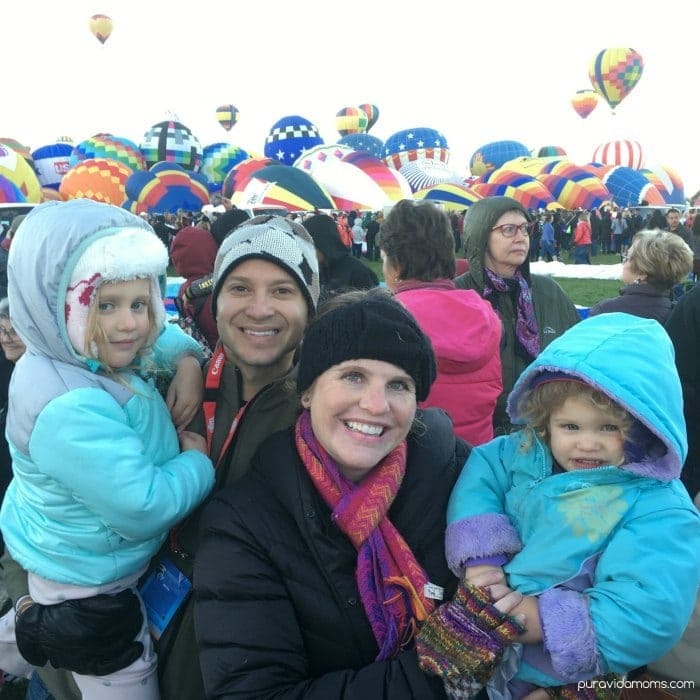 We were hosted as media visitors for the Balloon Fiesta, and this post contains affiliate links that help support Pura Vida Moms at no additional cost to you. For first time visitors like ourselves, I wanted to create a quick packing list for families with young children. The Balloon Fiesta is a great place for young children to explore the outdoors and the beauty of balloons- but it’s also good to be prepared. There is a lot of walking and spending time outside, so it’s important to have the right stuff- but not too much stuff. One thing I didn’t know before attending Balloon Fiesta is that the activities mostly run from 5- 9 am and 5-9 pm, so most of the day is free. In our case, this schedule was perfect to grab a nice nap between activities! We took along our City Mini stroller. We have two daughters, 2, and 4, and our 4 year old usually prefers to walk. We own a Double Bob stroller too, but we decided to leave it at home. I didn’t realize that we would be leaving out hotel room before 4 am to see the am activities, and neither of our girls wanted to walk so I wished we would have had the double stroller. Make sure your stroller has good tires- we walked on gravel, cement, asphalt and grass. It’s cold at 4 am! Dress in layers because the weather does warm up a bit by 9 am when the morning activities finish. Closed toed shoes are a must- not necessarily boots. We were dressed pretty warm! The climate in New Mexico is extremely dry- so bring water. There is water for sale at the facilities, but there aren’t places to refill bottles. There’s also tons of amazing food vendors at the Balloon Fiesta- but lines can be long and if yu have young children that get hungry fast, pack some snacks. 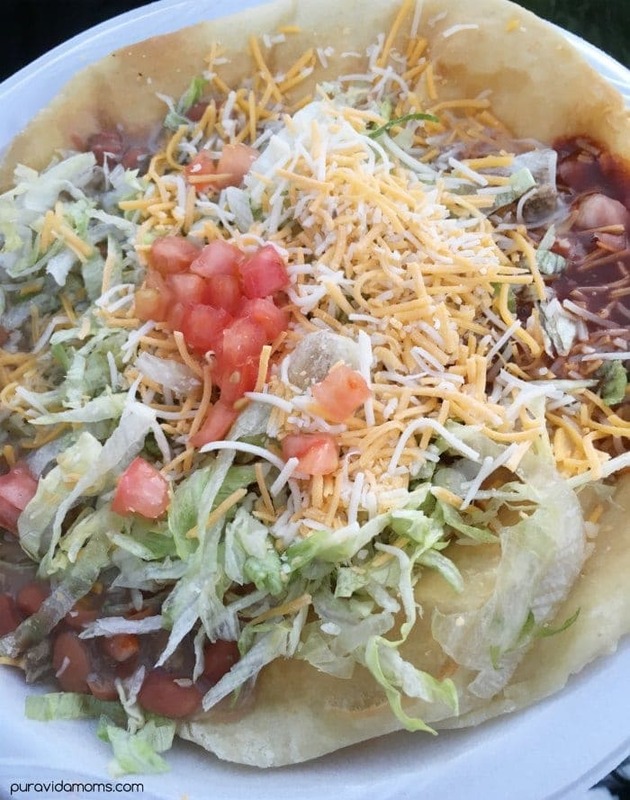 I ate this Indian Taco at a rate I am embarrassed to admit. It was delicious! Between food truck vendors and porta-potties, hand sanitizer or wipes are a must for the whole family. For the Twinkle Twinkle Glow and laser and fireworks shows in the evening, we had a big blanket that we sat on to picnic and watched the festivities (you can bring your own food and drinks to Balloon Fiesta, though no alcohol is allowed). The big blanket was great in the morning to keep us warm. Lawn chairs were popular at Balloon Fiesta- but I didn’t want to lug them around. We had a lot of fun in the Canon tent! The Balloon Fiesta is photography heaven. I had almost as much fun watching the amazing camera equipment other people had as I did actually watching the balloons! Lots of people also had tripods, which would have been a great idea for the night photos. Be prepared to geek out taking photos. (I think I took 600 on my Canon Rebel!) 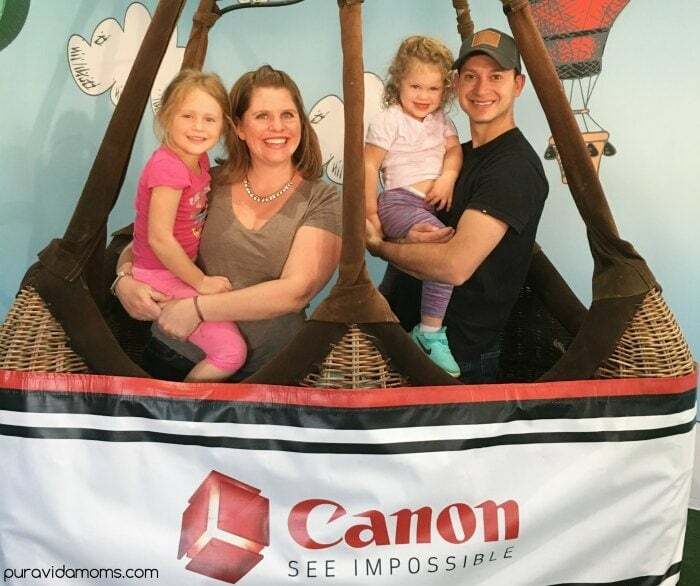 Canon is an official sponsor of the Balloon Fiesta, and their tent was totally amazing. Taking glow sticks is totally optional– but there are a zillion places selling overpriced light-up toys. We were totally unprepared and spent way more money that I would have liked on glow in the dark toys that have since been forgotten. Do yourself a favor and head to the local Dollar Store and stock up on glow sticks. Check out our hot air ballooning ride video to get a behind the scenes look at what hot air ballooning is like from start to finish! 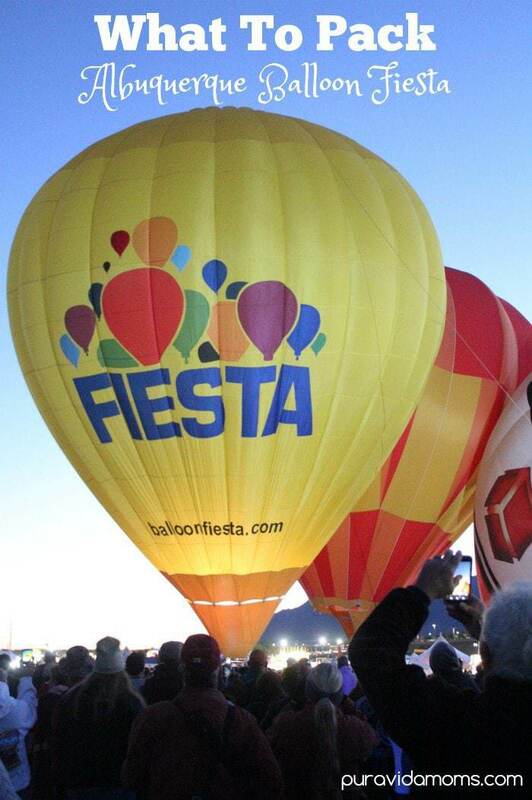 Have you been to Balloon Fiesta before? Is it on your bucket list? Let us know in the comments below! Looking for more family travel tips from Pura Vida Moms?